Description: The former 7049 is shown trailing two others and a Dash 9 on the 601. Description: Off the 601/602 locals it seems, along with the other then-active SD40-2's. Description: Westbound behind a pair of veteran EMD's. Description: A pair of EMD's idle the night away in the facilities at Northtown. Description: Northtown to Superior daily manifest with some great power once again! Description: Looks like these SD40-2s days are done. Once power heads over here, it usually doesn't come out again. Description: Two former BN units move around 44th as they go from track to track. Description: This was one of the better catches of the day for me when I was at Northtown Yard. The 7951 is one of just 10 SD45-2s that got rebuilt into the 79XX series. 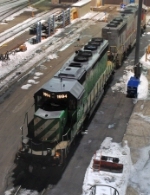 Here's its seen making a light power move at the diesel shops with a GP39-2, SD40-2, and an SD60M. If only this was power for a road train, or even the BN-CP Transfer! Description: Seems like this is the story lately, the light dissapears before the train gets to go... Two Dueces yank their 123 cars, 7269 ft train for Staples.